Nothing beats an ice cold glass of water on a hot day. It gets so humid here in the summer and I’m not a person who enjoys the heat. I always keep a bottle of water with me wherever I go. I know it can get a little blah drinking water day and day out. Sometimes, I’ll whip up some fruit infused water just to keep things interesting. I know some people who hate the taste of water and the only way they can drink it is if it is mixed with something. Mix your water with fruit and keep it healthy! I enjoy trying new recipes and found several that look very promising! 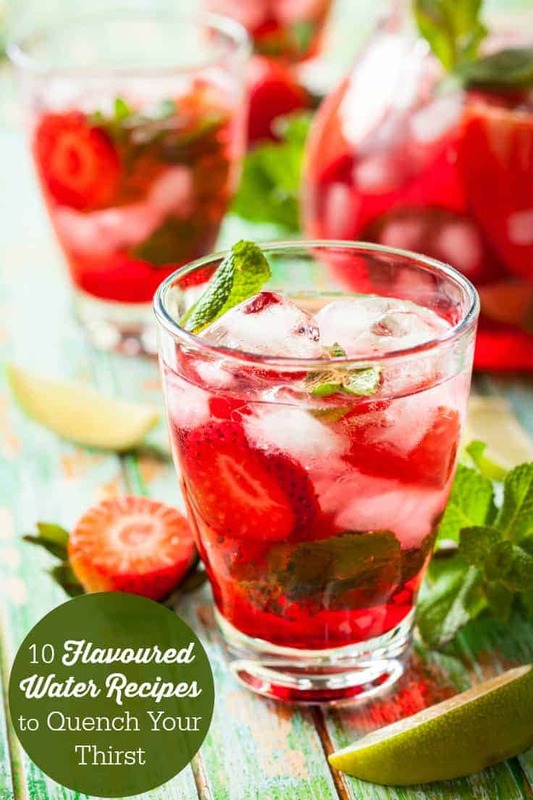 I made a list of 10 flavoured water recipes to quench your thirst this summer. Two of the recipes are from my blog and the others are ones I found online that I want to try. All are healthy! Some of the recipes are as easy as plopping a few pieces of chopped fruit into a water pitcher. Others involve a little bit more work like my Strawberry Agua Fresca. Not much extra work though and it’s worth the effort! Next time your at the grocery store or farmer’s market, pick up some extra fruit, veggies and herbs and make yourself some infused water. Experiment with different flavours. Who knows – maybe you’ll discover a new recipe that you’ll crave all summer long? I’ve been drinking the Citrus Bliss Infused Water like crazy lately. I’ll probably get sick of it and then move onto something else! Do you have a favourite water recipe? Lemon Cucumber Mint Water sounds so refreshing! These are fantastic and going to keep and pin these drinks to use and try making later and share with my friends also! Thanks for these recipes! Cucumber water is super refreshing. I never thought to add mint as well but will try it for sure. I love flavoured water. It really feels ‘spa’ to fancy up tap water! I have pinned this for my future reference. The Lemon Cucumber Mint Water sounds so good. I love adding fresh mint to my water. I usually do raspberries and mint, but definitely going to try it with the Lemon & Cucumber next time. Bookmarking this page! Thanks! Some awesome water recipes here, I been making my own green iced tea, but that starts to get boring after awhile, it’s nice to change it up once and awhile!! I don’t have a favourite water recipe, but some of these look thirst-quenching for sure. Mmmmm!!! My fav!! And so much better for you than soda!! I find the more water I drink the better I feel and the more weight I tend to lose!! Great recipes 🙂 Can’t wait to try them!! The Strawberry Agua Fresca looks great and sounds tasty! I am looking for a water that Superstore use to carry that tasted like and Orange creamsicle, any ideas? I thought “infused’ water was just plopping a few pieces of chopped fruit into water. Some great flavor combos – I am horrible at drinking enough water so a little flavor added makes me drink more for sure! Always looking for something to give water a little boost in flavor and not calories. I am going to have to try some of these out because I need to be drinking more water but get tired of it by itself. Thanks so much for all the great ideas! They seem so refreshing! Thank you for the recipes! My favourite is a mojito fake-out (without the alcohol). I love the idea of jazzing up plain water! It makes water more creative and exciting! When I first saw the picture I thought it was Sangria… but these recipes look even better! Thank you! Love these ideas! The photo looks beautiful and tasty and healthy! 🙂 Thanks for sharing. I drink lots of plain water, but I agree that sometimes it can get boring. These drink recipes sound interesting. Wow,these are going to make some perfect summer drinks,thanks cant wait to try one! I NEED to try all of these! I never drink enough water and I think these would really help! im going to pin them! thanks!!!! Wow these a lot of ways to bring relief from the heat. I will try a few. I can not wait to try these different infused waters!